In recent days, there has been some talk here about wealth effects and how they might complicate the interpretation of the multiplier. The claims made about that the multiplier understates the likely expansion as a result of the wealth effects is somewhat misleading but that is another story. The fact is that the inclusion of wealth effects has a long standing in economics. They were initially used as part of the mainstream denial that involuntary unemployment could exist in a market economy with flexible prices. This goes back to the famous Keynes versus Classics debates. In that debate, the mainstream argued that the wealth effects would be sufficient to restore full employment during a recession without any need for government intervention. The problem is that the ideas do not withstand scrutiny – either theoretically and empirically. They certainly do not provide a credible attack on the Modern Monetary Theory (MMT) claim that fiscal policy intervention is required to combat a situation where aggregate demand is deficient relative to the productive capacity of the economy. This spending gap manifests as involuntary unemployment in the absence of an appropriate policy response. Given the ideological position that these “wealth effects” have occupied in the literature I am always suspicious when someone proposes we take them seriously. That is what this blog is about. The mainstream view in the early 1930s, the so-called British Treasury view held that unemployment could only persist as long as real wages were prevented from reaching their market-clearing optimum. This view has largely survived into the modern day and can be found in new classical and new Keynesian thinking. The solution that follows is that if you observe persistent unemployment then real wages must be too high (relative to full employment labour productivity. I have provided the background to this assertion in some recent blogs – Less income, less work, less income, more work! and Nobel prize – hardly noble. I repeat the essentials here for continuity purposes. In Chapters 2 and 7 of my 2008 book with Joan Muysken – Full Employment abandoned – we consider the type of mainstream labour market that asserts that unemployment occurs when the real wage is too high. where w is the real wage which is the ratio of the nominal wage, W and the price level P.
The real wage is considered to be determined in the labour market, that is, exclusively by labour demand and labour supply. Keynes showed that this assumption is clearly false. It is obvious that the nominal wage is determined in the labour market and the real wage is not known until producers set prices in the product market (that is, in the shops etc). The labour demand (Ld) function is the derivative of the production function with respect to labour input (the marginal product). The ad hoc imposition of the so-called law of diminishing returns ensures this derivative is positive but declining as employment is increased. In English, the claim is that as extra units of labour are added to a fixed stock of capital they become increasingly unproductive and hence there is diminishing products (returns). Hence, the labour demand function is downward sloping with respect to real wages. The argument is that firms have to pay the real wage (an amount of actual product) to the marginal workers and so they will only hire extra labour if the amount the worker contributes to production is more than the real wage. The assertion of diminishing returns assures the demand curve will be downward sloping – so the firm will only be prepared to hire extra workers if the real wage is reduced. In this blog – Less income, less work, less income, more work! – I show why this conception of technology and productivity does not hold up in the real world. There is very little evidence in the real world to support the ad hoc assertion of the “law of diminishing returns”. The mainstream simply assert it and then try to associate their “religious beliefs” with the physical laws of nature. The mainstream labour supply (Ls) function is based on the idea that the worker has a choice between work (a bad) and leisure (a good), with work being tolerated only to gain income. The relative price mediating this choice (between work and leisure) is the real wage which measures the price of leisure relative to income. That is an extra hour of leisure “costs” the real wage that the worker could have earned in that hour. So as the price of leisure rises the willingness to enjoy it declines. The worker is conceived of at all times making very complicated calculations – which are described by the mainstream economists as setting the “marginal rate of substitution between consumption and leisure equals to the real wage”. This means that the worker is alleged to have a coherent hour by hour schedule calibrating how much dissatisfaction he/she gets from working and how much satisfaction (utility) he/she gets from not working (enjoying leisure). The real wage is the vehicle to render these two competing uses of time compatible at a work allocation where the worker maximises satisfaction. In this blog – Less income, less work, less income, more work! – I show that to get an upward sloping labour labour supply function the mainstream model merely asserts that workers are more sensitive to price movements than income shifts. The empirical evidence does not support that assertion at the macroeconomic level. In fact, the empirical evidence supports a near vertical aggregate labour supply relationship with respect to real wages. The important point is that despite all the pretensions to be “scientific” the mainstream model cannot tell us which way things work out in reality. Any results derived from this model are essentially a product of the imagination of the theorist. Now from a macroeconomic perspective, the model was used to deny the existence of involuntary unemployment. The mainstream result is that the interaction between the labour demand and supply functions determines the real level of the economy at any point in time. Aggregate supply (using the aggregation fudge of the so-called representative firm) is thus a technological mapping from the equilibrium employment determined by the equilibrium relationship into the production function. Say’s Law (in whatever version) is then invoked to assume away any problems in matching aggregate demand with this supply of goods and services. The equilibrium employment level, E* in the graph (assuming it now applies to the overall economy rather than an individual), is constructed as being full employment because it suggests that every firm who wants to employ at the equilibrium real wage, w* can find workers who are willing to work and every worker who is willing to work at that real wage can find an employer willing to employ them. The Classical economist thus considered the preferences of the workers always would have a bearing on the labour market outcome and through price adjustment (real wage flexibility) any changes in supply preferences would – via mediation through the demand side – result in a changing full employment level. In other words, adoption of the competitive paradigm demands that departures from full employment are ephemeral at best. Any sustained unemployment (say BC in the graph) must be due to a real wage constraint (a real wage, w1, above the marginal productivity at implied equilibrium full employment) which would be competed away more or less immediately. A fundamental aspect of this labour market conception is that fluctuations in unemployment reflect supply-side changes arising from imperfect information or reflecting changing preferences between leisure and work. In a 1982 article, close to his death, Sidney Weintraub – Hicks on IS-LM: more explanation? – (which was published in the Journal of Post Keynesian Economics, Spring, Vol IV, No. 3) examined the flexprice model put forward by JR Hicks. Hicks was famous for shoehorning the insights of Keynes’ General Theory into the sterile IS-LM framework which formed the basis of the so-called neo-classical synthesis. For non-economists, the import of this development in economic theory was that these insights were effectively lost. Please read my blog – Those bad Keynesians are to blame – for more discussion on this point. To Hicks, apparently, if all prices were flexible, presumably with money wages dropping sharply there would not be any unemployment. This was his flexprice model, according to the opening quote … [was] … culled from a mountain of writings of others. In other words, Hicks was just reiterating the mainstream position of the day. The position indeed had a long history. The classical economists (which was the orthodoxy of the day) adopted the view that there could be no general deficiency in planned spending which would leave total productive capacity idle. They admitted that specific goods and services could be “over-produced” but believed that rapid market adjustments would ensure there could never be a generalised glut or ever occur. These authorities did not in fact focus on price flexibility as the key to full employment: their position was rather that a generalised overproduction. This view became known as “Say’s Law” which has been popularised as saying “supply creates its own demand”. The logic is that by supplying goods and services into the market, producers either wanted to consume their own output (thus, QED!) or wanted to exchange it for other goods supplied into the market. So even if there was a desire to save in any period, the withheld consumption would be matched by (planned) investment spending given that the saving was just a signal that consumers wanted to consume in the future. The mechanism for bringing saving and investment into equality which then (allegedly) ensured aggregate demand always equalled aggregate supply was the loanable funds market. So Hicks’ view which was the orthodoxy during the Great Depression was really consistent with the classical view augmented to implicate “fixed wages” which allegedly prevented the market from working as the classical economists had envisaged. We can now see the key difference between the Keynesian and classical approaches to the determination of national income. The Keynesian assumption . . . is that the price level is stuck . . . The classical assumption is that the price level is flexible . . . The price level adjusts to ensure that national income is always at the natural rate. The classical assumption best describes the long run . . . The Keynesian assumption best describes the short run. In this mainstream macroeconomics dream world, the classical competitive labour market model is deemed to be applicable to the real world, which differentiates itself as a result of wage fixity. To repeat – the real wage is assumed to be determined in the labour market at the intersection of the labour demand (Ld) function and the labour supply (Ls) function. The equilibrium employment level is constructed as full employment because it suggests that every firm who wants to employ at that real wage can find workers who are willing to work and every worker who is willing to work at that real wage can find an employer willing to employ them. Frictional unemployment is easily derived from the Classical labour market representation, as is voluntary unemployment. Holding technology constant (and hence the Ld curve fixed), all changes in employment (and hence unemployment) are driven by labour supply shifts. There have been many articles written by key mainstream economists (such as Milton Friedman) that argue that business cycles are driven by labour supply shifts. Thus all shifts in unemployment should be consistent with the behaviour of quits in the economy (that is, quits are constructed as being countercyclical). why do quits rise in booms and fall in recessions? If recessions are due to informational mistakes, quits should rise in recessions and fall in booms, just the reverse of what happens in the real world. If you examine any data on quit rate behaviour from any country you will see that the quit rate behaves in a cyclical fashion as we would expect – that is, it rises when times are good and falls when times are bad. Many studies have demonstrated this phenomenon for several countries where decent data is available. Rates of layoff and discharges, which reflects the demand-side of the labour market are always firmly counter-cyclical as we would expect. Firms layoff workers when there is deficient aggregate demand and hire again when sales pick-up. Again this is contrary to the orthodox logic. The clear significance of this behaviour is that the orthodox explanation of unemployment that Mankiw considers to be reasonable is not supported by empirical reality. Given that quits are not countercyclical then the orthodox labour market model that constructs unemployment as being a supply-side phenomenon is plain wrong. It is only during the Great Depression that the concept of involuntary unemployment appeared explicitly in the literature. The discipline of macroeconomics emerged in this period and was built, in part, on the recognition that what might apply for individuals in isolation may not apply to all individuals in a system (the so-called fallacy of composition). Accordingly, involuntary unemployment was constructed as a systemic failure of the economy to provide enough jobs for all those willing to work at existing money wages. This conception challenged the dominant Classical competitive paradigm outlined above that only allowed for frictional unemployment to exist. Keynes later cast the differences between the Classical perspective and the new ‘macroeconomic’ perspective in terms of the distinction between voluntary and involuntary unemployment. To fully appreciate the differences between these two conceptions on unemployment we need to appreciate the different concepts of equilibrium that underpin them. 1. Equilibrium is a point of rest; forces leading to change are either absent or countervailing. 2. Equilibrium is a point at which supply equals demand. … either excess demand or excess supply creates a force leading to a change (e.g. in prices) which will eliminate the excess demand or supply. The Classical notion of full employment as represented by Point A in the above diagram is consistent with both ideas of equilibrium being satisfied. Unless rigidities were imposed by government, the flexible price labour market would always ensure full employment was maintained. In the extreme, and in a so-called free society, it could be argued that any rigidity could be construed as voluntary because the workers could dismiss a government that was constraining their choices (as long as the workers had suffrage). In the The General Theory of Employment, Interest, and Money – Keynes (page 5) showed that frictional unemployment (people moving between jobs) is easily derived from the Classical labour market model. But he was more concerned with mass unemployment. Keynes used the inability of the Neoclassical economists to explain the reality of the 1930s to introduce the concept of involuntary unemployment. Understanding the meaning of involuntary unemployment requires a prior understanding of how the concept of effective demand was introduced into the analysis. This introduction negated the Classical view that the real outcomes of the economy were determined by the full employment equilibrium achieved in the labour market. Post Keynesians typically begin with the General Theory in explicating the principle of effective demand. However, the essential elements underpinning the critique of Say and the modern understanding of involuntary unemployment in a monetary capitalist economy can be found in Marx, particularly in Theories of Surplus Value. Marx anticipated the modern distinction between nominal and effective demand which lies in the understanding of the real contribution of Keynes. In Theories of Surplus Value, Marx noted that in denying the possibility of a general glut, Ricardo appeals to unlimited needs of consumers for commodities and any particular saturation would be quickly overcome by increased demands for other commodities. Marx vehemently attacked Say and the proposition that there could be no general overproduction in a capitalist economy. Much of what Keynes subsequently said was previously developed by Marx. He started from the proposition that capitalists aim to accumulate ever increasing wealth by extracting surplus value. The generation of profit thus requires two actions: (a) surplus value creation as the object of production which aims to reduce the payments to labour (limit their consuming power); and (b) Sale of commodities in market which is limited by the consuming power of society. So Marx quickly established the inherent contradiction in capitalism and deemed this the precondition for crises. M. Say has, most satisfactorily shown that there is no amount of capital which may not be employed in a country because a demand is only limited by production. No man produces but with a view to consume or sell, and he never sells but with an intention to purchase some other commodity, which may be immediately useful to him, or which may contribute to future production. By producing, then, he necessarily becomes either the consumer of his own goods, or the purchaser and consumer of the goods of some other person. It is not to be supposed that he should for any length of time be ill-informed of the commodities which he can most advantageously produce to attain the object which he has in view, namely the possession of other goods; and therefore it is not probably that he will continually produce a commodity for which there is no demand. Marx said that Say’s Law was refuted by the fact that crises occur. The unity of sale and purchase is brought about forcibly by crises but is not given in advance as in Say’s Law. Marx saw that sale and purchase are separate actions with separate motivations. He showed that Say’s Law can only hold in barter which denies the essential features of a monetary capitalism. In barter you may consume your own good whereas in capitalism Marx said that “no man produces with a view to consume his own product”. A capitalist must sell and crises occur when sales cannot be made or only at prices below cost. A capitalist may have produced in order to sell (Say’s Law) but if sales cannot be made how does this help? To which Marx responded by saying “What a pleasant portrayal of bourgeois relations!” It was clear to Marx that capitalists aim to sell to transform commodities back into money and realise profits. Consumption is not the aim of the capitalist. He said that only the workers sell commodities (labour power) to consume. The break between production and realisation can occur because of this separation. For example, the existence of the chain of production and lines of credit means that a merchant may buy cloth on credit, and the farmer sells to spinner, spinner to weaver etc. If the merchant cannot sell, no-one in chain is paid. Interestingly, this section of Marx’s analysis is a precursor to multiplier concept. Please read my blog – Spending multipliers – for more discussion on this point. But this argument established for the first time that crises manifest as monetary phenomena and mass unemployment was not a voluntary outcome. … too much of a particular commodity may be produced, of which there may be such a glut in the market as to not repay the capital expended on it; but this cannot be the case with respect to all commodities. But Marx showed that all commodities can be in oversupply except money. The necessity for a commodity to transform itself into money means only that the necessity exists for all commodities. It is the general nature of the Money-Commodity-Money process that includes the separation of purchase and sale and their unity which invokes the possibility of a general glut. The demand for corn is limited by the mouths which are to eat it, for shoes and coats by the persons who are wear them; but though a community, or a part of a community, may have as much corn, and as many hats and shoes as it is able or may wish to consume, the same cannot be said of every commodity produced by the nature or by art. Some would consume more wine if they had the ability to procure it. Others, having enough of wine, would wish to increase the quantity or improve the quality of their furniture. Others might wish to ornament their grounds, or to enlarge their houses. The wish to all or some of these is implanted in every man’s breast; nothing is required but the means, and nothing can afford the means but an increase in production. Here Marx makes a crucial distinction that resonates into the modern debate. Overproduction has nothing much to do with absolute needs. The debate is not about whether production can outstrip needs. It is only needs with capacity to pay that count! So this was the first real statement of the concept of the principle of effective demand that became central to Keynes’ work. Ricardo would say that if a person wanted some shoes then they could acquire the means to buy them by producing something themselves. But this is a barter economy. So why not just produce the shoes him/herself? In capitalism, when there is overproduction – goods flood the market. But it is the actual producers (workers) suffer from a lack of commodities. It is nonsense to say that they should produce more. … only concerned with demand that is backed by ability to pay. It is not a question of absolute over-production – over-production as such in relation to the absolute need or the desire to possess commodities. Many Post Keynesians do not acknowledge this link back to Marx. Whatever, the notion developed and elaborated on in Keynes’ General Theory was that the labour market does not determine employment nor the real wage. Actual employment is determined in product market (where final goods and services are sold) by the level of effective demand. Effective demand is the level of output where business profit expectations are consistent with spending plans by consumers and firms. It was identified that there is a limit on profitable expansion of private output. The level of effective demand places a ration on the labour market. There is no certainty that this limit will be reached after the economy achieves full employment. The possibility of unemployment was not due to demand misperceptions on the part of business firms but rather a deficiency in aggregate spending (demand). Keynes thus introduced the new concept of involuntary unemployment – a category denied by the NC model. The involuntary nature of the unemployment related to its source as a systemic failure which no single individual could influence. In terms of the Classical labour market diagram above, if one retains the notion that the labour market quantity is always determined by the interaction between labour supply and demand, then the concept of involuntary unemployment as defined by Keynes does not make any sense. The clue to the new concept of unemployment lay in the understanding that the labour market did not determine the employment level and the quantity of labour supplied and demanded did not have to bear any relation to the Classical optimal labour supply and labour demand schedules. In terms of the diagram above, Point B can be seen as being consistent with the idea of involuntary unemployment. One way of understanding the concept of involuntary unemployment is to “think” within the mainstream logic for a second. Consider the mainstream labour supply curve in the diagram above which is derived from the workers’ optimal choices between labour and leisure (as above). According to this theory, “full employment” (market clearing equilibrium) is located anywhere along this supply function. This is because anyone who wants a job can get one via real wage cuts. But the concept of involuntary unemployment refutes this. How? We can only construct the mainstream labour supply function (in some conceptual way) as the maximum number of hours that are willingly supplied at each wage rate. 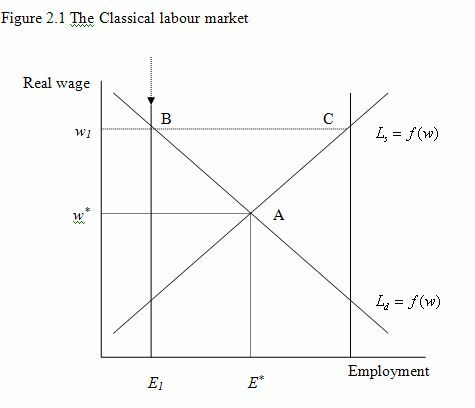 So Points A and C in the diagram below are conceptually (according to the classical logic) points where the workers are getting as much satisfaction at the margin from working the extra hour (via the real wage gained) as they would if they enjoyed an hour of leisure. Anywhere left of the Labour supply line must (according to the same logic) be inferior and signify positions where the workers’ satisfaction from an extra hour of work (and the real wage gained) is greater than the utility of the hour of leisure. So while workers in total prefer to be at Point A they are rationed by the effective demand in the economy to being at B. 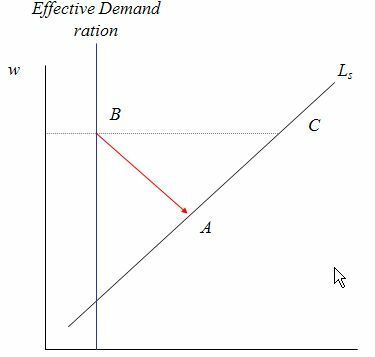 So if the effective demand constraint moved a little to the right workers would be prepared to work the extra hour even though the real wage might be lower (say movements from B to A). Having conducted that sort of mental exercise, Keynes then was able to conclude that Point B was a situation where there was involuntary unemployment. The essential point is that the demand for labour is derived from the product market as a reflection of the demand for final goods and the resulting level of effective demand. This is depicted in the diagram above by the vertical line at E1, which represents the effective demand constraint that is imposed on the labour market from the goods market. At Point B, workers are willing to supply more labour even at lower real wages. In what sense do we say that a worker who is involuntarily unemployed is powerless to change his/her situation? This is also a key question in understanding the distinction between voluntary and involuntary unemployment. In terms of the diagram above, the mainstream construction is that at B, workers should offer themselves at lower real wages to increase the demand for their services. But how does an individual worker do this? The real wage is after all a ratio of prices that are determined in two separate markets. At the same time, firms also are unlikely to risk the wrath of their existing workforce by capriciously exploiting slack labour markets to negotiate lower money wages for all even if it was institutionally possible to do so. Further, if all workers do manage to achieve a cut in the real wage then the fallacy of composition inherent in the Classical story becomes binding. The outcomes applicable to a single individual will not automatically apply for all individuals together. Why? Answer: because wages are a component of total costs and total income. Cutting costs may improve the willingness of suppliers to increase output but cutting income will damage aggregate demand and reduce overall sales potential. Therefore the Classical policy solution that across the board real wage cuts will reduce unemployment is prone to fail. The final issue is whether point B is an equilibrium, which would suggest that once the economy was at B it would stay there unless something else changed. This is in violation of the belief implicit in the second concept of equilibrium discussed above that market forces will resolve any discrepancy between supply and demand. However, at point B, the labour supply function has no bearing on the labour market outcome. At Point B firms’ expectations are being fulfilled in the sense they are selling what they produced based on prior projections of aggregate demand. There is no reason for them to change their level of output and employ more workers. This is what Keynesians called this situation an “underemployment equilibrium” and coincides with a state of rest – albeit with mass unemployment. So what is the driving factor in creating the underemployment equilibrium where workers are involuntarily unemployed? In my recent book with Joan Muysken – Full Employment abandoned we show that involuntary unemployment arises when the private sector, in aggregate, desires to earn the monetary unit of account, but doesn’t desire to spend all it earns. Firms do not hire because they cannot sell the output that would be produced. In this situation, nominal (or real) wage cuts per se do not clear the labour market, unless those cuts somehow eliminate the desire of the private sector to net save, and thereby increase (investment) spending. The only entity that can provide the non-government sector with net financial assets (net savings) and thereby simultaneously accommodate any net desire to save and eliminate unemployment is the government sector. It does this by (deficit) spending. The obvious conclusion is that unemployment occurs when net government spending is too low to accommodate the need to pay taxes and the desire to net save. That is an essential proposition of MMT. Please read the blog – What causes mass unemployment? – for more detail. The previous discussion was (long) background for understanding where wealth effects crept into economics. This was another aspect of the 1930s and 1940ss debate. The claim was that the existence of mass unemployment was only the result of not allowing wages and prices to adjust downward to eliminate the excess supply of labour and goods and services. Keynes argued that his result was general (that is, that employment is a function of effective demand) and was not dependent on the assumption that money wages are fixed (which he noted was an institutional reality with positive benefits in itself). He said that even if money wages fell, prices would fall in proportion (as unit costs fell and competition prevailed) and so the real wage would be unaltered (or thereabouts). Keynes argued that money wages, going down by 10 percent, would carry prices down by 10 percent (or nearly so). Another 20 percent pay drop would carry a corresponding price descent. Keynes’ argument was that only through somehow stimulating consumption or investment could employment increase. Price and wage “flexibility” were utterly irrelevant aspects with one exception (excluding expectational anomalies). So while the initial debate was that Keynes’ theory of unemployment rested on the existence of sticky wages this soon morphed into a debate about wealth effects. The mainstream economists (represented by Pigou and others) agreed that the proportionality between money wages and prices may result in the real wage being “sticky” despite nominal price flexibility. The relationship between money wages and prices was based on Keynes assumption that pricing was competitive and so if costs fell firms would be forced to lower prices. This observation then opened up their next line of attack based on wealth effects. In recent times, you will have heard the term liquidity trap used to describe the current situation where monetary policy becomes ineffective at very low interest rates because everyone will hold every extra dollar introduced into the economy as demand balances. In 1937, John Hicks noted the liquidity trap was “a special form of Mr. Keynes’s theory” because it coincided with a state where the demand for money was not sensitive to income levels and/or was highly sensitive to interest rate changes. People demanded cash holdings as a buffer against interest rate uncertainty (given they could hold interest-bearing bonds as an alternative source of wealth). The model assumes that under normal conditions interest rates fall if the money supply rises because people have to be induced to hold the extra cash and will only do this if the opportunity cost of hold non-interest bearing cash is lower. At some level of interest rates, everyone will expect rates to rise and thus bond prices to fall and so no-one will invest in bonds in expectation of suffering capital losses. This is the notion of a liquidity trap. According to the logic, monetary policy (represented in this debate as variations in the money supply) will have no impact on aggregate demand because people will be prepared to hold all new money as cash. The point of the liquidity trap in relation to flexibility of prices was that if money wages and prices fell (but the real wage was unaltered) the real money supply was still higher (actual real value of the money stock). Normally this would drive down interest rates as above, which would according to their logic stimulate aggregate demand. Keynes was fully aware of this hypothetical source of stimulus and was termed “the Keynes effect”. The mainstream considered this to be the normal situation. But when there was a liquidity trap this effect could not work because interest rates did not respond to changes in the real money supply. There were other related debates in this regard (for example, the 1947 observation by Tobin that the Keynes effect would be stifled because investment was not very sensitive to interest rate changes). The point was that the mainstream attack on Keynes centred on his logic only applying in special cases – money wage rigidity; liquidity trap etc. The pragramatic Keynesians, argued that inasmuch as these rigidities were operative real world constraints, there was still a justification for using aggregate demand policies (like a fiscal stimulus) to push the economy out of an underemployment equilibrium. So while not conceding the point that the whole Keynesian attack on the mainstream classical model rested on the existence of these special cases, there was still a pragmatic policy argument to be made supporting discretionary fiscal intervention. But the approach was challenged by the next mainstream (pro-market) attack on Keynes. Enter the real balance effect (wealth effect). ‘The Classical Stationary State’, 1943, Economic Journal, 53(4), 243-51. ‘Economic Progress in a Stable Environment’, Economica, 14, 180-88. These contributions attempted to enrich the specification of the Keynesian consumption function that hitherto had been specified in terms of income and interest rates. So rising disposable income stimulated consumption via the marginal propensity to consume whereas rising interest rates reduced consumption because they reduced the opportunity cost of saving (and hence favoured future consumption). Pigou and others claimed that in addition to these influences, consumption was a positive function of real net wealth which he defined as the real supply of money and the real supply of public debt. The importance of this argument should be obvious. Even if all the other sources of mainstream market-based recoveries are not forthcoming when wages and prices fall, the lower prices deliver these positive wealth effects on consumption. In other words, a consumption-led recovery can occur when there is deflation. This effect was called the Pigou or Real Balance effect. Importantly, Pigou believed that the existence of a liquidity trap was non binding and that rising consumption would restore full employment as long as wages and prices were flexible. So he argued that ultimately, mass unemployment arose because of nominal wage rigidities and the solution to a recession was to cut wages. The British government and some of the EMU nations clearly have been thinking along these lines. There were logical difficulties in actually constructing the case. The argument did not imply that consumers ran down their wealth holdings to finance their additional consumption. It was clearly acknowledged that this would require a sale of assets to another individual which may be problematic in a deep recession. The argument introduced ad hoc psychic notions that by feeling richer (in real terms), consumers were emboldened to consume more out of their current income. It is in this sense that the recent claims by JKH that the wealth effects are embodied in the value (or shifts) in the marginal propensity to consume have substance. There was tension within the mainstream paradigm (see the 1951 article by Lloyd Metzler, ‘Wealth, Saving and the Rate of Interest’, Journal of Political Economy, 59(2), 93-116) who argued that in one fell stroke, while Pigou had restated the automatic tendency of the economy to full employment, he has also rendered the classical dichotomy whereby increases in the money supply could not have real effects (that is, the argument that aggregate monetary policy interventions were ineffective) implausible. A major attack on Pigou’s idea came from in Michal Kalecki’s 1944 article (‘Professor Pigou on the Classical Stationary State: A comment’, Economic Journal, 54, 131-2) where he distinguished between “inside” and “outside” money and wealth. If you have access to JSTOR, you can read the article HERE. … the stock of money is constant, and thus its real value increases in the course of the wage fall. Thus, argues Professor Pigou, the real value of existing possessions increases. The richer people are, however, the less they are willing to save out of a given real income. Thus if the increase in the real value of the stock of money reaches a certain limit, people will save nothing out of real incomes corresponding to full employment. At that point full employment long-run equilibrium will be reached. The increase in the real value of the stock of money does not mean a rise in the total real value of possessions if all the money (cash and deposits) is “backed” by credits to persons and firms, i.e. if all the assets of the banking system consist of such credits. For in this case, to the gain of money holders there corresponds an equal loss of the bank debtors. The total real value of possessions increases only to the extent to which money is backed by gold. In other words, the total real value of possessions increases as a result of the wage-fall only by the increase in the real value of gold. If in the initial position the stock of gold is small as compared with the national wealth, it will take an enormous fall in wage rates and prices to reach the point when saving out of the full employment income is zero. The adjustment required would increase catastrophically the real value of debts, and would consequently lead to wholesale bankruptcy and a ” confidence crisis.” The ” adjustment ” would probably never be carried to the end: if the workers persisted in their game of unrestricted competition, the Government would introduce a wage stop under the pressure of employers. So “inside” money (bank deposits) and inside wealth (private sector debt) are not net wealth. In MMT, we note that all horizontal transactions net to zero because an asset held by a private entity always is matched by a corresponding liability in the private sector. In other words, once you aggregate, all “inside” debts net to zero. Please read the suite of blogs – Deficit spending 101 – Part 1 – Deficit spending 101 – Part 2 – Deficit spending 101 – Part 3 – for more information on the difference between horizontal transactions within the non-government sector and vertical transactions between the government and non-government sectors which do not net to zero. Kalecki understood this point. His argument is that the Pigou effect could only be conceived in terms of “outside” money (base money and reserves) and outside wealth (government bonds). This is because there are no corresponding liabilities to these assets. So Kalecki was arguing that the size of the effect would be significantly smaller in practice. More recently, economists such as Barro who asserts that consumers and firms are Ricardian in motivation refuted the possibility that outstanding public debt constitutes “outside” or net private wealth. These Ricardian agents apparently know that the public debt has to be paid back via higher future taxes and so never feel “wealthier” as a result of their holdings. In other words, the Pigou effect does not kick in because as the real value of the bond holdings rise (when prices fall) so does the implied real tax burden. While I am not defending the Pigou argument, the Ricardian case is on the lunatic fringe of economics. Please read my blog – Pushing the fantasy barrow – for more discussion on this point. The empirical relevance of these wealth effects has also been questioned. While most economists (me included) will acknowledge that conceptually they might occur the studies that have sought to estimate the magnitude of the real balance effects all show them to be very small. So small that their practical significance in restoring full employment when a deep recession occurs is zero. As an extreme illustration to make the point, though a cruel and prohibitive one from a policy standpoint, when prices fall to such levels that those owning “pennies” become “millionaires” – a calamitous prospect! – full employment may well be assured … For example, to hazard a crude guess, in the current economy … to be effective the real-asset influence on consumption might require a price fall extending beyond 50 per cent. If you have JSTOR access you can read this article HERE. Many post Keynesians would argue that the real-balance effect is a weak reed for restoring full employment in a contract-using monetararized economy, and to rely on it would compel prices to plunge so dramatically as to invite universal bankruptcy, spelling pauperism and an ominous enlargement of the army of unemployed. The chain of events is more conducive to street riots and a spirit of revolt, rather than for creating a favorable investment climate. A transformation of capitalism, rather than an era of full employment, would seem to be a superior prediction. So the estimated impacts of wealth effects operating through consumption been found to be tiny in the usual range that prices might be expected to fall. This means that to have any impact of significance, prices would have to fall dramatically and this would not only be destabilising but improbable. From a theoretical perspective, these wealth effects might have some standing. But from an empirical angle they have very little relevance for policy. Attempting to gain a stimulus via the Pigou mechanisms by cutting nominal wages during a recession will only help if it reduces the desire to save. There is no research (ever) that has established this proposition. So cutting wages will just imperil those with nominal contracts (the couples that had borrowed) and reduce their standard of living but do nothing to increase employment. Either saving has to be reduced or funded by public deficits. The preferred policy response is to stimulate effective demand via fiscal policy and leave the wage system alone. And if you really believed in the effectiveness of real balance effects, then think of Japan which struggled continually with deflation in the 1990s with virtually no growth in consumption. It was only when fiscal policy entered the fray in the form of rising deficits that output started to recover. The resort to wealth effects was always just another mainstream ruse to justify their hatred of fiscal intervention. And … it was another failed argument. That is (more than) enough for today! So deficits are not deficits at all. They should be renamed Floats and should be set back to zero each year. A big Float in any year is just the Governments expectation of the demand it must create to maintain full employment. A negative Float is a year in which demand is reduced by the Government by Fiscal or Tax means to prevent a shortage of workers. This is a transparent system that all trading partners would see and understand. If I have this right your a chance to convince the press and the politicians because its a simple story to tell. The target for the Government is 100% employment all the time. I think all the effort trying to get policy wonks to listen is the long way round. Get the average Joe interested instead by convincing a few celebrities (both Hollywood and Finance) to champion the idea. Jobs for all cant be that hard to sell. I will start with my friends now that I have a simple story. Of course if I have it wrong someone better say so. Pigou used the wealth effect to argue xyz. Kalecki pointed out that Pigou’s error was the assumption of exogenous supply of money. Doesn’t mean that there is no wealth term in the consumption function in an endogenous money framework of describing economies. There can be one and still no Pigou effect. Note I haven’t used the phrase “wealth effect”. So not sure what this means. Given the ideological position that these “wealth effects” have occupied in the literature I am always suspicious when someone proposes we take them seriously. Punchy, I’m not an economist, but floats sound like a good idea to me. I’d like to ask someone who understands economics better than I do a question. If Marx showed that all commodities can be in over supply except money, does that refute Friedman’s theory about money supply causing inflation and if so does that mean that no matter how much QE there is, money supply can’t create inflation unless there is an excess in the capacity to supply aggregate demand. There appears to be one big problem with chartalism. There is nothing keeping the people from one day uprising against the use of state money just as the early Americans did with England (and as we have seen throughout history in various nations). The value of money might be set by the state, but ultimately, that money must also be accepted by the private sector as acceptable. If the private sector rejects this money the whole system crumbles. Another way of stating your point is that if the state cannot enforce the use of its money to pay taxes, then all bets are off. In fact, though, this is absolutely central to MMT, not something we’ve left out. Bill, I don’t think you ever written on the Cambridge Capital Controversy and its logical implications for the consistency of what you are calling the “classical” theory of the labor market. I think the CCC shows that a monotone decreasing demand curve for labor lacks theoretical foundation, even under neoclassical assumptions. I actually have an article in the Manchester School arguing this. Would you care to comment? Thanks. while Austrians and others may say that fiat money is a deterioration from a gold standard, a compelling argument can be made for the reverse. Gold standards usually come in when governments lose their power vis a vis private or foreign banks. The Austrians will also argue that fiat money is inherently unstable. If that is so someone should take an honest look at some of the wild fluctuations in the history of metal backed moneys and then argue that they are “inherently” better. Who has the money power in society may seem like a hard choice. Do we trust private bankers whose interests may be inimical to ours or do we trust corruptible public officials who may not even know what they are doing? My choice would be “trust but verify.” That is trust the government but put in place non-perverse incentives and an enforceable system of checks and balances. The fact is we once had a fairly good civil service system in the U.S. I don’t see why a “federal reserve” integrated into “treasury” could not work. A little off topic, but I’m looking for comments on this. IMO, it is NOT fiat currency. It is the DEBT based on fiat currency that is unstable (as in demand deposit default). Until MMT supporters realize that we need to write comments so that 90% of people that can read and understand a daily newspaper can understand what we are saying we are not going to get any support from the press or politicians because they just wont understand what we are trying to tell them. Bill is on to it with the simple diagrams used recently. I wont share these thoughts again, just read only now. Good luck convincing the policy wonks! But this argument seems to exactly justify the NC argument that excessively high rates of interest are to blame for the involuntary unemployment, irrespective of what the short term or riskless rates happen to be. If the investment rate of interest was lower, then real wages would increase, firms would higher more workers, etc. And about “cancellation” of wealth, I would be very careful here. The liabilities of firms do not “cancel” with the assets of households in any behavioral meaningful sense. Only the debts that one household owes another should be cancelled, and even there, you are making a lot of assumptions — e.g. that there is no inequality, or that the middle class is not indebted to the rich, etc. Any time you want to use this type of balance sheet consolidation, there needs to be an underlying economic rationale. The act of balance sheet consolidation is exactly the same as the act of selecting a “representative household”, or “representative firm”, etc. You are saying that the motivations and behavior of a group of decision makers can be aggregated by the model so that there was a single representative decision maker whose balance sheet and income statement is equal to the consolidated balance sheet and income statement of the group that you have aggregated. And in that case, no transactions occurring between members of the same group are visible to your model, or motivate any behavior in your model. But when you aggregate both households and firms, then there is no production, no consumption, no lending, no borrowing, no labor demand and no labor supply, and no investment. I don’t see how that level of aggregation can meaningfully model anything, let alone employment. It is just as meaningless as consolidating the balance sheets of the non-government and government sector to get a “national” balance sheet. How would this “national” balance sheet be relevant for explaining why firms are not hiring workers? You need to at least limit your balance sheet consolidation to households and firms to answer why households cannot find employment with firms. @Nathan: That’s what legal tender laws do for you. If you require all merchants to post a price denominated in legal tender, and require that they must transact if that price is met (and put them in prison if they don’t) then the private sector will always accept the sovereign’s legal tender (as long as the sovereign retains sovereignty over its jurisdiction). The fact that V is not stable is what kills monetarism. Or the demand it must create to close the “output deficit” (might as well hijack the word from the deficit hysterics).